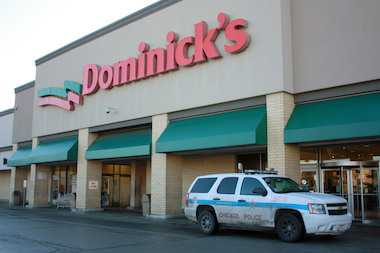 The South Shore Dominick's, 2101 E. 71st St., went out of business in 2013. HYDE PARK — Ald. Leslie Hairston (5th) has backed down on using eminent domain to get a new grocer to replace the shuttered Dominick’s in South Shore and will now let World Fresh Foods set up shop. Hairston told DNAinfo Chicago Thursday she hammered out a deal with the owners to change their business model from the one used by the chain’s other stores run under the name Pueblo Supermarkets in Puerto Rico and the U.S. Virgin Islands before allowing them to move into Jeffery Plaza. She said the grocer wants to bring in catering, a juice bar, local vendors and other services requested by the community after Dominick's closed in late December 2013. "It's going to have a little bit of everything," Hairston said. The alderman originally balked at the idea of letting any operation run by the owners of Pueblo move in. When Jeffery Plaza owner Shervin Mateen originally broached the idea in October, Hairston said she would attempt to block the move because of the chain’s bad reputation and pushed the city to use eminent domain to acquire the shopping center. According to a 2010 report in the Daily News of the Virgin Islands, Pueblo's owner, Chicago resident Ahmad Al Khatib, was accused of stealing $1.3 million worth of electricity for his four Virgin Island stores. Under a plea deal, Al Khatib pleaded no contest to tampering and illegal use of utility equipment and agreed to pay a $12,000 fine and provide additional community services, according to the newspaper. Hairston said Al Khatib's lawyer explained the legal troubles, and she was satisfied that it was not as serious as it first appeared and would not happen in South Shore. She said she was assured that Al Khatib would not be the operator of the store in South Shore. A lease is expected to be signed in the next week to fill the space at 71st Street and Jeffery Boulevard. Hairston said once the lease is signed, she will ask the city to back down on using eminent domain to acquire the shopping center. She said the new operator, Pat Lipska, hopes to eventually expand to five locations and possibly open a distribution center. A representative of Cannon Commercial, the owner of Jeffery Plaza, was not immediately available to comment. The Mayor’s Office was not immediately available to comment about whether the deal was now acceptable and eminent domain would be taken off the table.